Do you know somebody who has helped to advance the public relations profession in Central Pennsylvania? Or perhaps you know a non-public relations professional who has shown outstanding communication skills in a leadership role? Consider nominating them for one of our individual awards. Once again, we have waived the fee for all individual awards. The CEO Communicator of the Year Award honors the outstanding performance of central Pennsylvania area chief executive officers in their roles as chief communicator. The role of the CEO has evolved. Not only do they encourage and adapt to changing business models, but frequently the CEO must take the lead in communicating with employees, shareholders, customers, suppliers and other stakeholders to achieve success for his organization. In order to qualify, nominees should effectively show how they act as a communicator by leadership whether in a crisis or in day-to-day operations. Leadership may include the CEO’s appearance in the media, before industry groups, community groups or leadership in civic, religious or business organizations. 200-word statement from nominee on why he/she should be considered, including accomplishments achieved during entry period Nominees must be chief executive officers or hold equivalent positions in the central Pennsylvania area. Nominators should provide details about the nominee and his/her qualifications with reference to the period between September 1, 2015 and August 31, 2016. The Executive Director Communicator of the Year Award honors the outstanding performance of Central Pennsylvania area executive directors in their roles as chief communicator. The role of the executive directors has evolved. Not only do they encourage and adapt to changing business models, but frequently the executive director must take the lead in communicating with employees, shareholders, customers, suppliers and other stakeholders to achieve success for his organization. In order to qualify, nominees should effectively show how they act as a communicator by leadership whether in a crisis or in day-to-day operations. Leadership may include the executive director’s appearance in the media, before industry groups, community groups or leadership in civic, religious or business organizations. 200-word statement from nominee on why he/she should be considered, including accomplishments achieved during entry period Nominees must be an executive director or hold equivalent positions in the central Pennsylvania area. Nominators should provide details about the nominee and his/her qualifications with reference to the period between September 1, 2015 and August 31, 2016. The Elected Official Communicator of the Year Award honors the outstanding performance of Central Pennsylvania area elected officials in their roles as chief communicator. This category includes anyone from a state representative, school board official, public servant that needs to communicate a message around an issue. Frequently the elected official must take the lead in communicating with the public, employees, shareholders, customers, suppliers and other stakeholders to achieve success for his organization. In order to qualify, nominees should effectively show how they act as a communicator by leadership whether in a crisis or in day-to-day operations. Leadership may include the elected official’s appearance in the media, before industry groups, community groups or leadership in civic, religious or business organizations. 200-word statement from nominee on why he/she should be considered, including accomplishments achieved during entry period Nominees must be an elected official or hold equivalent positions in the central Pennsylvania area. Nominators should provide details about the nominee and his/her qualifications with reference to the period between September 1, 2015 and August 31, 2016. Award recognizes a relative newcomer to public relations for demonstrating exceptional leadership and professional achievements during his/her initial years in the profession. All PR professionals who have been in full-time practice for less than three years (began full-time practice January 1, 2014 or later) are eligible. (This period excludes internships and part-time employment while working on a degree.) If entry is submitted by the nominee, entry should also include one letter of recommendation written by a current manager, supervisor or client. Activities outside work, including charity work, industry associations, etc. 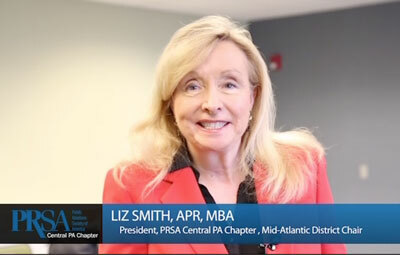 Named in honor of Mr. Fred Leuschner, a prominent public relations practitioner in Central Pennsylvania, the Leuschner Award was established to recognize public relations leaders who have been leaders in the profession as well as in the chapter. In specific, the Leuschner Award is presented annually to a chapter member who has demonstrated a strong commitment to the chapter, the community and the profession. To nominate yourself or a colleague, please provide a written summary listing the nominee’s leadership in each of these five areas of excellence, citing specific examples or expertise in each area, if possible. You can upload the information as PDFs through the online form.